Shown above: 2 Giorgio Club Chairs, 1 Giorgio Sofa, and 1 Blok Concrete Square Coffee Table in black. 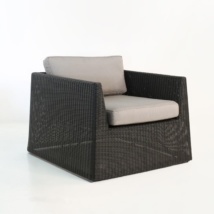 Refresh and modernize your outdoor patio space with the Giorgio outdoor wicker furniture collection. The dynamic shape of these pieces make it stand out and will make a statement in your outdoor or indoor living space. This outdoor furniture is made with Viro® outdoor wicker and Sunbrella® cushions. The construction is built to last so you can enjoy it for many years to come. Enjoy relaxing with your family and friends in the great outdoors with this collection. The Sunbrella® cushions as shown are free, the throw pillows are not included.